Us, on August 27: "Hasbro should paint this Luke Cage in a yellow shirt, and also give us a Claire Temple." Hasbro, like a week later: "Okay, here." When Luke Cage meets Nurse Claire Temple, he discovers that even a bullet-proof [sic] man sometimes needs someone to help him keep it together. This set is a Walmart exclusive, and while it isn't in stores yet, it's been in and out of stock on their website a few times, and it ships for free, so why wait? 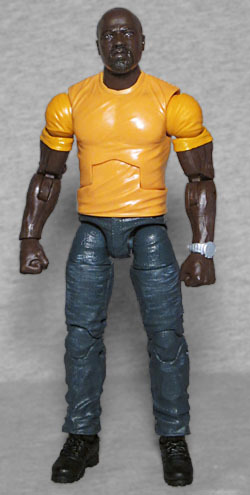 This Luke Cage is exactly the same one seen in the SDCC Defenders box set, just given new, more traditionally Luke Cage-y, colors. So again, we're a bit sad to not get a figure wearing a sweatshirt (because, in the words of Method Man, bullethole hoodies is the fashion), but yellow is as much a signifier for Power Man as red is for Iron Man. It's such a bright color that the shadows where the biceps joint joins the arms and shoulders stand out as unmissable black lines, as though there were a stripe on his sleeve. This probably could have been avoided by molding the upper arms in yellow rather than skintone, like the chest and shoulders, but then the bare arms might have been mismatched, so it's a chice you have to make. His wristwatch is still here, a separate piece fit onto the arm. I don't really remeber Luke's watch being an important thing in the show, or even something that's ever drawn attention to, but hey, Hasbro included it. These days, comics are mostly known for one thing - superheroes - but back in the day, they covered everything. Westerns, horror, romance, war, pretty much anything you could think of was fair game for the printed page, but eventually most of those genres atrophied and whithered away. In the '40s and '50s, for instance, Marvel was doing great business publishing comics about women with jobs and alliterative names: Millie the Model, Sherry the Showgirl, Tessie the Typist, etc. But even after superheroes had (re)claimed their prominence, Marvel was still giving it the old college try, publishing the medical drama Night Nurse in 1972. "Night Nurse" was not one specific person, but rather the job description of three roommates: Georgia Jenkins, Christine Palmer, and Linda Carter. (No, not Wonder Woman: this Linda had been around since 1961.) 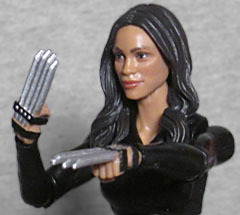 In 2004, she showed up running an underground clinic that specialized in treating superheroes' injuries, and that idea was combined with a doctor character from Hero for Hire to create the MCU's Claire Temple. Claire is played by Rosario Dawson, in her third comic role. And thanks to the Josie and the Pussycats dolls, all three of them have gotten toys! The likeness here is excellent from some angles, but there are others where she just looks like any random pretty girl. Meghan Markle, maybe? Someone. Thank goodness for the advanced face-painting technology, eh? The figure uses the arms and legs from the medium body, paired with a new torso. Since she's got superhero legs and not jeans, it looks like she's wearing leggings rather than pants. The new chest gives her a fitted shirt, a half-placket with a substantial collar. It's a nice sculpt, and if Jessica Jones and her legs are any indication, we'll probably be seeing it again. For who? Don't know yet. Who would have predicted Mary Jane just from the existence of Jessica? Pick a woman who'd wear a professional yet casual blouse, and there ya go. Also, props to the factory's painters for including a little bit of skin visible at her ankles, so her leggings don't just disappear into her shoes. That's cool. Claire gets all the set's accessories. 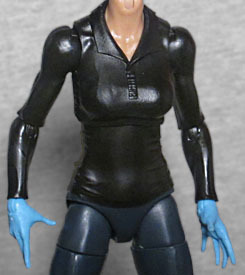 Like MJ, she carries a bag, in a dark grey rather than red; she's also got two extra pairs of hands: while her hands are bare in the box, you can also give her a pair of hands with her tiger claw weapons, or a pair molded in a dusty blue to represent her nitrile gloves (same as the Minimate had). For everybody who was unable to get the SDCC Defenders set, this is a terrific way to get Luke, and if you did get the set, he's different enough to still be worthwhile. Plus, Claire's new for everybody! This is a good pairing, and it's the first Walmart exclusive two-pack in more than a year.